All season long, the midfield has been the divisive part of Liverpool’s team. James Nalton investigates the latest changes and possibilities for the future. On paper, the midfield which started the game against Southampton was widely considered Liverpool’s best. A trio which many had wanted to see from the start of the season but had only appeared fleetingly. And even on those occasions, it felt like Naby Keita wasn’t quite up to speed and not quite in his best position, playing on the left in a formation which was a cross between 4-3-3 and 4-2-3-1. Against Southampton, they finally started in a midfield three: The new No. 8, the intelligent box-to-box Dutchman, and the stout Brazilian holding midfielder. But it didn’t unfold as planned. 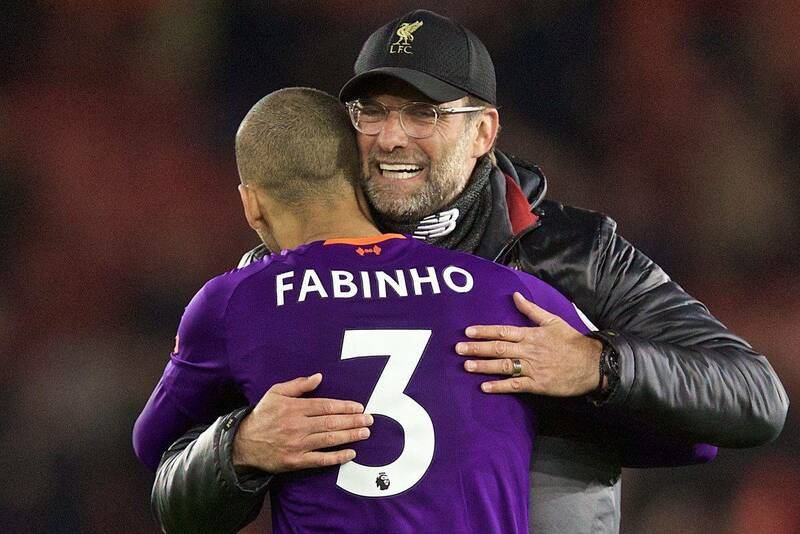 The forward runs of Georginio Wijnaldum and Keita left Fabinho exposed and Southampton regularly bypassed him, which in turn exposed the defence. Attacking full-backs aggravated this. A double pivot 4-2-3-1 or 4-2-2-2 might have been a better option but even in the three, one player should be able to support Fabinho while the other breaks. It didn’t quite work out like that. It was a reminder that football is not played on paper. It was a reminder that tactics are as much about mentality and overall philosophy as they are about positioning. 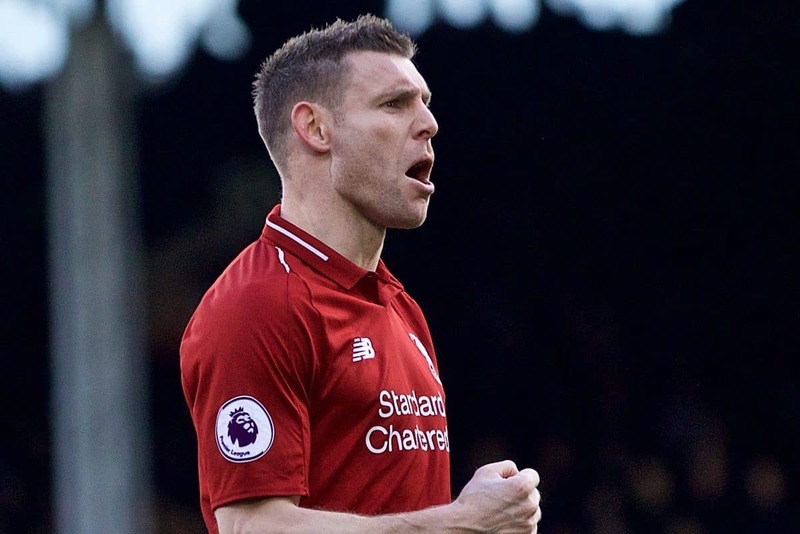 Even though Milner in not a natural right-back and at this stage of his career may be unable to match the athleticism and natural ability in the position, something changed. The stats below may help explain what. 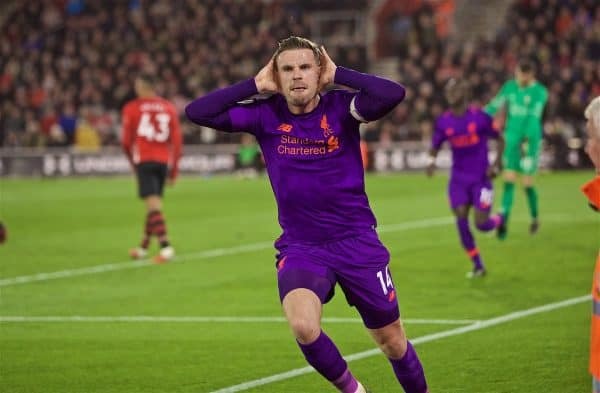 The combination of himself and Henderson in key areas added a steel to the side and something Klopp referred to as “verbal aggression”, both of which, it seems, are required in a title race. The stats reflect the idea that Liverpool’s full-backs, not the midfielders, are the creative force. In terms of big chances created, Keita and Wijnaldum have one apiece, Fabinho has two with Henderson on zero. 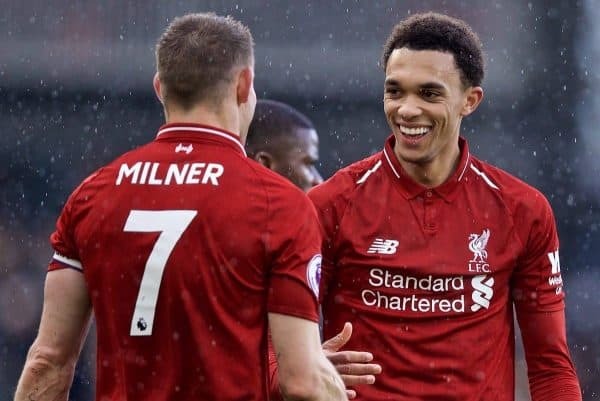 Among the midfielders, Milner leads the way with six, but Trent Alexander-Arnold has eight while Andy Robertson has created 12 big chances. Milner leads the way for key passes with 2.3 per 90 minutes, and 1.3 key passes per 90 from crosses. The next in line behind Milner in this particular stat is Lallana, with 1.7 key passes per 90, but from the smaller sample size of just 465 minutes. Trent is on 1.6, with Robertson on 1.4, but the rest of the midfield lags behind with Fabinho and Wijnaldum on 0.8, Keita and Henderson 0.5. Milner is also the most productive midfielder according to our alternative stats which look at many different ways players can contribute to goals. He benefits from playing in the wider midfield roles and takes up similar positions to those which see Alexander-Arnold and Robertson create so much for Liverpool. 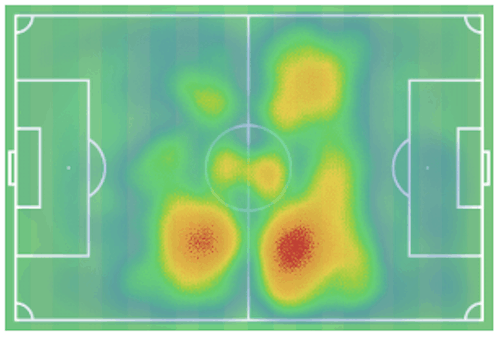 This is shown in the heatmaps below which compare Milner (top) to Wijnaldum (bottom). The vice-captain spends more time closer to the touchline, even though both play in wider midfield roles. Henderson, Fabinho, and Wijnaldum tend to do their work through the middle but those not in the holding role should probably still create more than they do. Against Southampton Henderson showed that he might produce more if used regularly in one of the advanced midfield roles. 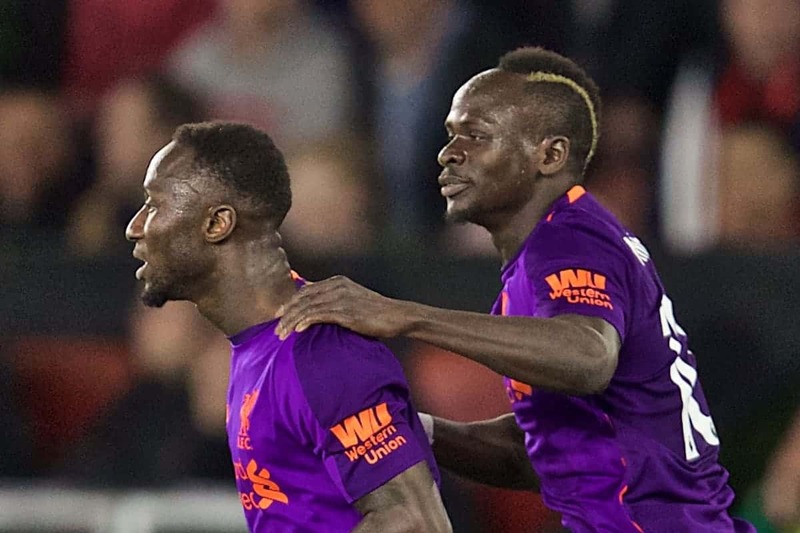 The Southampton game was another step forward in Keita’s Liverpool career which, despite accusations that his signing hasn’t worked, has shown far more positive signs than negative ones. He was trusted to play 88 minutes in this key fixture, and was only taken off when the job was done. He may prefer 4-2-3-1 as it’s closer to the 4-2-2-2 formation he thrived in at RB Leipzig, but in the 4-3-3 he has license to drop back alongside Fabinho as well as charging forward through the middle with and without the ball. His goal was an example of the latter. It was a perfect cross from Alexander-Arnold, but it needed attacking without fear due to the number of bodies Southampton had parked in their box. The difficulty of the situation is highlighted by its xG of 6 per cent (Infogoal) and 3 per cent (Understat). Once in a position to head the ball, the quality of the cross made the goal likely; the difficult part was getting into this position in the first place given the pace of the cross and the number of defenders. 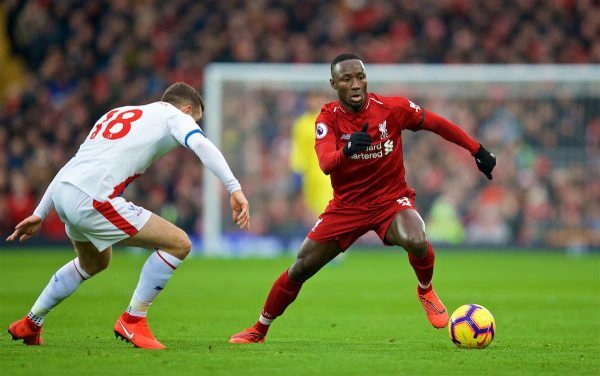 Klopp is likely to continue rotating his midfield, but there is an argument to say Keita should be alongside Fabinho more often. 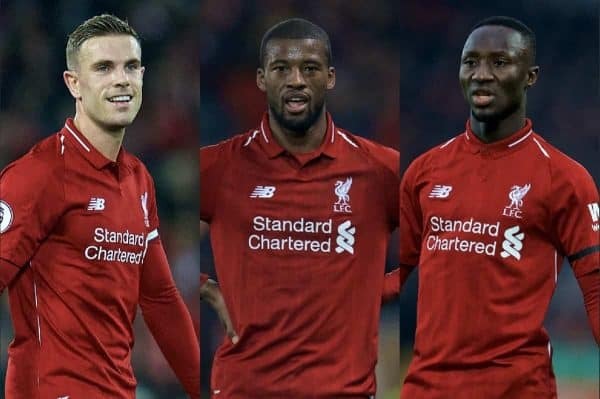 The next argument might be to say that one of Liverpool’s regular starters so far this season, Wijnaldum, should be rested and replace by one of Henderson or Milner. Judging by the stats that player should be Milner. Judging by his Southampton cameo that player should be Henderson. Henderson looks a lot more comfortable and effective further forward. There were worries that a recurring foot injury would prevent him from playing the more physically demanding box-to-box role on a regular basis, and he would be limited to appearances in slightly more stationary holding role. But as he surged onto the end of Firmino’s ball into the box, he looked as dynamic as he has done in a Liverpool shirt. 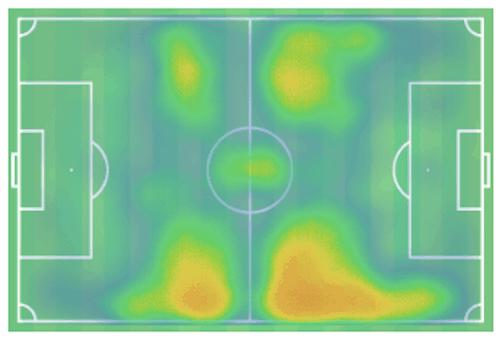 Fabinho is much better in the deeper role, and it is obviously his natural position. 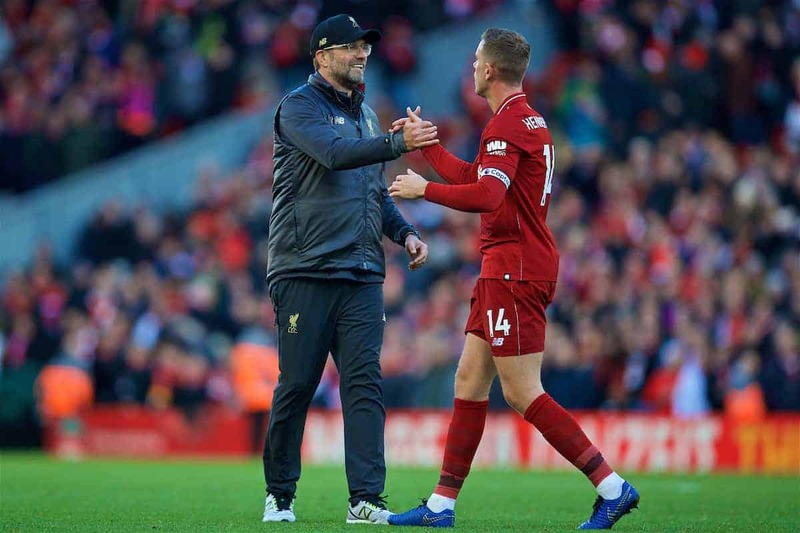 For Henderson, it can seem like he’s doing a job there and not entirely comfortable with the positional aspects, but on the occasions he plays further forward, he looks much more effective and he revealed that he’s been trying to convince Klopp he can do this job more regularly. “I’ve had conversations with the manager and felt as though I could affect things higher up [the pitch], and thankfully I managed to come on and contribute,” he said after the win at Southampton. Klopp agrees it’s an area his captain can add value to the team in. “I’ve seen him a lot like that. That’s Jordan, that’s him. Now it looks like he has a big part to play in the run in. Bigger than many thought he would, and perhaps even bigger than he himself expected when Keita and Fabinho arrived for big money in the summer. It would be tempting to use his impact off the bench again, and maybe this is the reason he looked so dynamic against Southampton, but the verbal aggression he adds, epitomised in his celebration, might be as important to Klopp’s heavy metal tactics as positional play and penetrative passing. 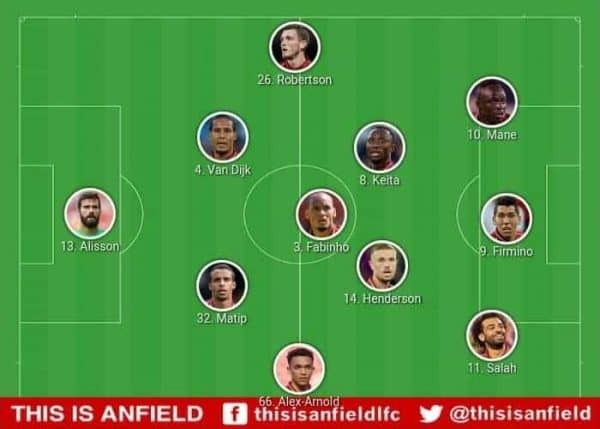 Fabinho should be the nailed on starter in the holding role, but from now on the other name going down early on the team sheet could be that of Henderson. The other slot will be up for grabs and there will need to be some rotation given the number of important games Liverpool have coming up. Luckily for them there were good signs from both Henderson and Keita in the most recent outing. They could be the pair to help Liverpool challenge now the club have worked hard to put themselves in a position to win the two biggest prizes on offer.